More Boat Images, past & present. Arthur in the boat prior to leaving on our journey on the Great Lakes. Myself and my wife in Wychwood Forest. This image was taken for a group publicity article in a magazine. An encounter with river pirates left some damage! I have finally got my boat out for repair. It has been stored down at the old fort for far too long. This boat was built many years ago by the late Arthur William Baker, a very close personal friend and family friend. It was built to explore the Great Lakes, and every winter Arthur and I would make the run down to the Lakes and spend a week or two travelling and camping. The boat needs more work than I anticipated, so it will keep me busy for a while. Rains stopped work yesterday, and it is overcast today. I need some good sunshine for a change, something I am normally not fond of. This boat was built to a period style, though the exact name escapes me for present. 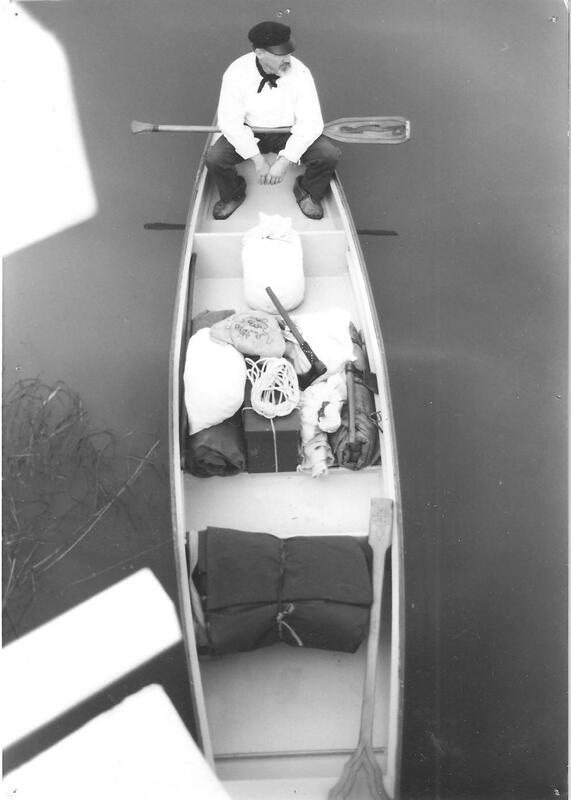 It handled well on the Great Lakes taking us far up little tributaries that only a canoe could possibly navigate. This boat is about 16 feet long, and a dream to handle by one or two persons loaded or unloaded. I am looking forward to getting it back in the water again. How To Make A Wira. An excellent explanation and description of trapping methods by someone who actually does it. Thanks Grimbo, well done. Outdoor Blogger Network gives me a plug! "I would be remiss if I didn’t bring A Woodrunner’s Diary to everyone’s attention. I knew I wanted this unique blog in the OBN, but wasn’t sure where it fit. Naturally, it ended up in “General Outdoors” . This blog is educational and fascinating, and if you haven’t done so, I’d encourage you to check it out. It makes learning fun". Spring Weather In New England. Well last weekend it snowed, brilliant weather for trekking and camping, but it did not last long. Then it rained, they say our drought is over. This morning was misty, looked great, wished I was under canvas out in the woods. But the sun came up and drove the mist away. It was a good day, so I did some work. Then it hailed, then it rained, no wonder they called it New England! I had a request from Murphyfish (John) to show my fishing tackle. Actually I am glad John asked, because a post on period fishing is probably well overdue. So this video is for anyone with and interest, but especially for John, who I have no doubt is a far better fisherman than I ever will be. Thank you John. 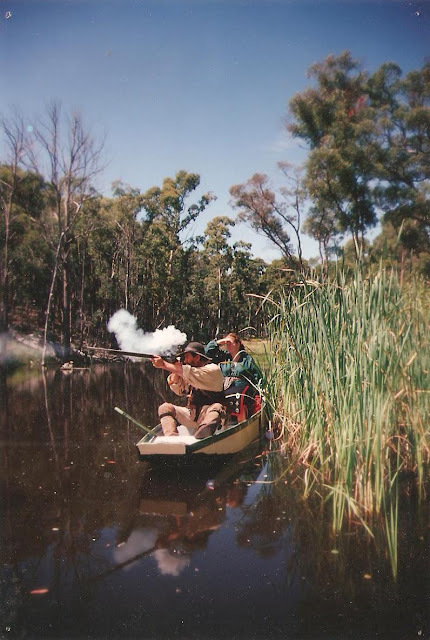 Promoting Living History In Australia. Historical Trekking Scenarios. Are They Important? I am prompted to make this post because of an interesting question posed by Martin. I had not intended to make this video public, at least not just yet, but I can't think of a better way to show what I mean about enacting a scenario. Setting a scenario for a trek is a bit like acting in a movie. You have to take the script seriously and act the part. Imagine if I was out scouting for enemy sign, and I walked into a tresspasser, how silly and embarrasing would that be?! Acting out a scenario gives you a real feel for the part, and depending on the scenario, it can affect how you travel and how you camp at night. Do you have to have a cold camp because the script calls for no fires? That means no hot drinks or hot food. Or you may consider it worth the risk of making fire if you are really cold, but take steps to conceal that fire. I have rather jumped the gun here with this short scene, because I have not even read the script yet! There will be other actors involved, and I am hoping this will fit in with what my youngest son has in mind, but if not, nothing lost. I enjoyed making it anyway. The story is as follows: It is 1742 on the frontier of the New World. A settler woman has been taken by woodland Indians whilst working in her garden. The local militia dare not follow immediately, because if they are discovered, it will mean certain death for the woman captive. Only one old man volunteers to try and save the woman, he is known by the settlers and the Indians as Le Loup, the wolf. This then is a scene from our group promotional movie, "Taken". This one's for you Martin, and thank you. My thanks to Dave for bringing this video to my attention, I find it very interesting. The Preditor Trap. PART ONE. I had a request from Dave at: http://www.davesact.com/ to supply information on primitive trapping methods. I can't authenticate all the methods used in the 18th century, but snares were used back then and have remained in use until this present day. I doubt very much that anyone now can devise a method that has not already been used in the past 300 years. The Preditor Trap. PART TWO. If there is anything that you would like information on or any videos you would like to see that you think may fall within my range of knowledge or skills, please let me know. How To Make Paper Cartridges For A Smoothbore Muzzleloader. PART TWO. How To Load A Muzzle-Loading Gun. How To Load A Muzzle-Loading Gun. PART ONE. Living History Images From The Czech Republic. This link was sent to me by Petr Scott Velan. Many thanks Petr. Daniel Boone is one of the better known colonial woodsmen who have inspired generations of kids and adults alike to take up 18th century living history and the woodsman persona. The information below starts a little late for my period of interest, but in the French and Indian War, Daniel Boone was present at Braddock's defeat, I believe, as a labourer on one of the supply wagons at the age of 22 years. The wagoner I understand saw the massacre by the French and Indians up ahead, and he cut the traces on the wagon, grabbed Daniel Boone and escaped on one of the wagon horses. But Boone was born on November 2nd 1734, so there is yet a lot of his early life to be discovered for those that are interested. Dispite Boone having been described as being a tall man, he was in fact only about 5 foot 8 inches tall. 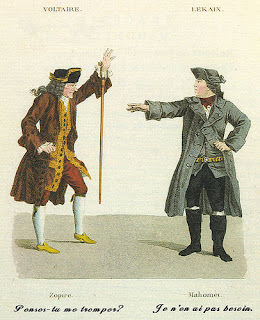 At the same time we must remember that this probably was pretty tall for a man in the 18th century. Oh yes, and I believe the coonskin cap is a myth. He wore a wide brimmed felt hat. Curiosity is natural to the soul of man and interesting objects have a powerful influence on our affections. Let these influencing powers actuate, by the permission or disposal of Providence, from selfish or social views, yet in time the mysterious will of Heaven is unfolded, and we behold our conduct , from whatever motives excited, operating to answer the important designs of heaven. Thus we behold Kentucky, lately an howling wilderness, the habitation of savages and wild beasts, become a fruitful field; this region, so favourably distinguished by nature, now become the habitation of civilization, at a period unparalleled in history, in the midst of a raging war, and under all the disadvantages of emigration to a country so remote from the inhabited parts of the continent. Here, where the hand of violence shed the blood of the innocent; where the horrid yells of savages, and the groans of the destressed, sounded in our ears, we now hear the praises and adorations of our Creator; where wretched wigwams stood, the miserable abode of savages, we behold the foundations of cities laid, that, in all probability, will equal the glory of the greatest upon earth. And we view Kentucky situated on the fertile banks of the great Ohio, rising from obscurity to shine with splendor, equal to any other of the states of the American hemisphere. The settling of this region well deserves a place in history. Most of the memorable events I have myself been exercised in; and, for the satisfaction of the public, will briefly relate the circumstances of my adventures, and scenes of life, from my first movement to this country until this day. It was on the first of May, in the year 1769, that I resigned my domestic happiness for a time, and left my family and peaceable habitation on the Yadkin River, in North Carolina, to wander through the wilderness of America, in quest of the country of Kentucky, in company with John Finley, John Stewart, Joseph Holden, James Monay, and William Cool. We proceeded successfully, and after a long and fatiguing journey through a mountainous wilderness, in a westward direction, on the seventh day of June following we found ourselves on Red-River, where John Finley had formerly been trading with the Indians, and, from the top of an eminence, saw with pleasure the beautiful level of Kentucky. Here let me observe, that for some time we had experienced the most uncomfortable weather as a prelibation of our future sufferings. At this place we encamped, and made a shelter to defend us from the inclement season, and began to hunt and reconnoitre the country. We found every where abundance of wild beasts of all sorts, through this vast forest. The buffalo were more frequent than I have seen cattle in the settlements, browzing on the leaves of the cane, or cropping the herbage on those extensive plains, fearless, because ignorant, of the violence of man. Sometimes we saw hundreds in a drove, and the numbers about the salt springs were amazing. In this forest, the habitation of beasts of every kind natural to America, we practiced hunting with great success, until the twenty-second day of December following. This day John Stewart and I had a pleasing ramble, but fortune changed the scene in the close of it. We had passed through a great forest, on which flood myriads of trees, some gay with blossoms, others rich with fruits. Nature was here a series of wonders, and a fund of delight. Here she displayed her ingenuity and industry in a variety of flowers and fruits, beautifully coloured, elegantly shaped, and charmingly flavoured; and we were diverted with innumerable animals presenting themselves perpetually to our view. In the decline of the day, near Kentucky river, as we ascended the brow of a small hill, a number of Indians rushed out of a thick cane-brake upon us, and made us prisoners. The time of our sorrow was nor arrived, and the scene fully opened. The Indians plundered us of what we had, and kept us in confinement seven days, treating us with common savage usage. During this time we discovered no uneasiness or desire to escape, which made them less suspicious of us; but in the dead of night, as we lay in a thick cane-brake by a large fire, when sleep had locked up their senses, my situation not disposing me for rest, I touched my companion, and gently awoke him. We improved this favourable opportunity, and departed, leaving them to take their rest, and speedily directed our course towards our old camp, but found it plundered, and the company dispersed and gone home. About this time my brother, Squire Boon, with another adventurer, who came to explore the country shortly after us, was wandering through the forest, determined to find me if possible, and accidentally found our camp. Notwithstanding the unfortunate circumstances of our company, and our dangerous situation, as surrounded with hostile savages, our meeting so fortunately in the wilderness made us reciprocally sensible of the utmost satisfaction. So much does friendship triumph over misfortune, that sorrows and sufferings vanish at the meeting not only of real friends, but of the most distant acquaintances, and substitute happiness in their room. Soon after this, my companion in captivity, John Stewart, was killed by the savages, and the man that came with my brother returned home by himself. We were then in a dangerous, helpless situation, exposed daily to perils and death amongst savages and wild beasts, not a white man in the country but ourselves. Thus situated, many hundred miles from our families in the howling wilderness, I believe few would have equally enjoyed the happiness we experienced. I often observed to my brother, You see now how little nature requires to be satisfied. Felicity, the companion of content, is rather found in our own breasts than in the enjoyment of external things; and I firmly believe it requires but a little philosophy to make a man happy in whatever state he is. This consists in a full resignation to the will of Providence; and a resigned soul finds pleasure in a path strewned with briars and thorns. We continued not in a state of indolence, but hunted every day, and prepared a little cottage to defend us from the winter storms. We remained there undisturbed during the winter; and on the first day of May, 1770, my brother returned home to the settlement by himself, for a new recruit of horses and ammunition, leaving me by myself, without bread, salt or sugar, without company of my fellow creatures, or even a horse or dog. I confess I never before was under greater necessity of exercising philosophy and fortitude. A few days I passed uncomfortably. The idea of a beloved wife and family, and their anxiety upon the account of my absence and exposed situation, made sensible impressions on my heart. A thousand dreadful apprehensions presented themselves to my view, and had undoubtedly disposed me to melancholy, if further indulged. One day I undertook a tour through the country, and the diversity and beauties of nature I met with in this charming season, expelled every gloomy and vexatious thought. Just at the close of day the gentle gales retired, and left the place to the disposal of a profound calm. Not a breeze shook the most tremulous leaf. I had gained the summit of a commanding ridge, and, looking round with astonishing delight, beheld the ample plains, the beauteous tracts below. On the other hand, I surveyed the famous river Ohio that rolled in silent dignity, marking the western boundary of Kentucky with inconceivable grandeur. At a vast distance I beheld the mountains lift their venerable brows, and penetrate the clouds. All things were still. I kindled a fire near a fountain of sweet water, and feasted on the loin of a buck, which a few hours before I had killed. The sullen shades of night soon overspread the whole hemisphere, and the earth seemed to gasp after the hovering moisture. My roving excursion this day had fatigued my body, and diverted my imagination. I laid me down to sleep, and I awoke not until the sun had chased away the night. I continued this tour, and in a few days explored a considerable part of the country, each day equally pleased as the first. I returned again to my old camp, which was not disturbed in my absence. I did not confine my lodging to it, but often reposed in thick cane-brakes, to avoid the savages, who, I believe, often visited my camp, but fortunately for me, in my absence. In this situation I was constantly exposed to danger and death. How unhappy such a situation for a man tormented with fear, which is vain if no danger comes, and if it does, only augments the pain. It was my happiness to be destitute of this afflicting passion, with which I had the greatest reason to be affected. The prowling wolves diverted my nocturnal hours with perpetual howlings; and the various species of animals in this vast forest, the day time, were continually in my view. Thus I was surrounded with plenty in the midst of want. I was happy in the midst of dangers and inconveniences. In such a diversity it was impossible I should be disposed to melancholy. No populous city, with all the varieties of commerce and stately structures, could afford so much pleasure to my mind, as the beauties of nature I found here. Thus, through an uninterrupted scene of sylvan pleasures, I spent the time until the 27th day of July following, when my brother, to my great felicity, met me, according to appointment, at our old camp. Shortly after, we left this place, not thinking it safe to stay there longer, and proceeded to Cumberland River, reconnoitring that part of the country until March, 1771, and giving names to the different waters. I returned safe to my old habitation, and found my family in happy circumstances. I sold my farm on the Yadkin, and what goods we could not carry with us; and on the twenty-fifth day of September, 1773, bade a farewell to our friends, and proceeded on our journey to Kentucky, in company with five families more, and forty men that joined us in Powel's Valley, which is one hundred and fifty miles from the now settled parts of Kentucky. This promising beginning was soon overcast with a cloud of adversity; for upon the tenth day of October, the rear of our company was attacked by a number of Indians, who killed six, and wounded one man. Of these my eldest son was one that fell in the action. Though we defended ourselves, and repulsed the enemy, yet this unhappy affair scattered our cattle, brought us into extreme difficulty, and so discouraged the whole company, that we retreated forty miles, to the settlement on Clinch River. We had passed over two mountains, viz. Powel's and Walden's, and were approaching Cumberland mountain when this adverse fortune overtook us. These mountains are in the wilderness, as we pass from the old settlements in Virginia to Kentucky, are ranged in a S.W. and N.E. direction, are of a great length and breadth, and not far distant from each other. Over these, nature hath formed passes that are less difficult than might be expected from a view of such huge piles. The aspect of these cliffs is so wild and horrid, that it is impossible to behold them without terror. The spectator is apt to imagine that nature had formerly suffered some violent convulsion; and that there are the dismembered remains of the dreadful shock; the ruins, not of Persepolis or Palmyra, but of the world! I remained with my family on Clinch until the sixth of June, 1774, when I and one Michael Stoner were solicited by Governor Dunmore of Virginia, to go to the Falls of the Ohio, to conduct into the settlement a number of surveyors that had been sent thither by him some months before; this country having about this time drawn the attention of many adventurers. We immediately complied with the Governor's request, and conducted in the surveyors, compleating a tour of eight hundred miles, through many difficulties, in sixty-two days. I finally finished my scabbard. I made it out of 5mm leather, then covered it with clothing weight leather. Not a top job, but it will do. Actually I am quite pleased how it turned out. The carrier straps I adapted from a couple of very old bridle straps that I had hanging in the shed. The British Group-New France Old England. This may seem a strange video to be showing here, but it holds some interesting information. Authenticity versus myth for one thing, and for another the fact that early history shapes our lives later on. Too many living historians concentrate only on their persona/character in a particular period. Let us say for instance that you are interpreting and English woodsman in 1742 as I am. 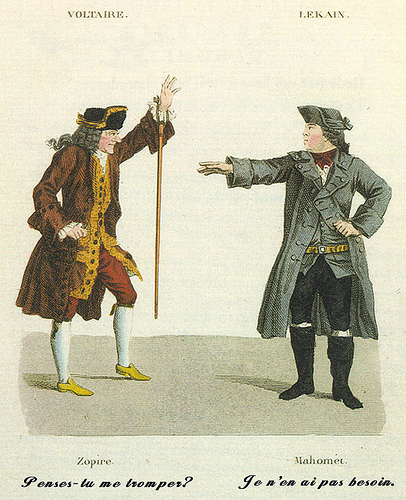 I did not just suddenly appear in 1742 dressed in 1742 style clothing and using 1742 equipment, I have a history before 1742, and that history shapes who and what I am now. If it is 1742 now, then I was born in 1680 somewhere in England. Who and what were my Father and his Father before him? What was I doing as soon as I was allowed out and about on my own? Did I work for my Father? When I arrived in the New World in 1700, had I any experience in trapping and hunting? What equipment did I bring from home? It is reasonable to suppose that if I was 20 years of age when I arrived in the New World that I would possess items made in the 17th century, and some of those items would still be with me in 1742. By the age of 20 coming from a working family in a small country village in England, it is likely that I have formed my own opinions on what clothing I like to wear, which clothing wears best and affords me the most protection. So now let’s for arguments sake move me forward in time to 1750. I am now in my 70s, and the clothing fashions are changing. Do I care about fashions born in Europe or England? No probably not. I like the way I am and the way I dress, I think the shorter weskits are silly and not practical. Why should I think of changing now? So here we are back in 2010, what do you own that was not made in 2010? The Cleaning & Maintainance Of A Muzzle-Loading Gun. Martin asked me if I was thinking of producing a video on muzzleloader cleaning and maintainance, well after much a do, I have, but it had to be in two parts as one video choked YouTube! So here it is, I hope you like it Martin. I have been doing it this way for over 30 years now, and it works for me. I am not a fan of modern cleaners. This is where I first saw this sort of promotional video. Thank you Grimbo.